Priscilla died on 22 August 1811 and was buried in Blackland, near Calne, on 25 August 1811. 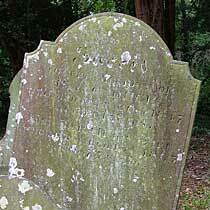 Thomas died on 26 January 1829 and their headstone still stands in the churchyard of St Peter, Blackland. In 1841 Abel was a carpenter living in Pickwick, Corsham, with wife Susanna, son Thomas and nephew Matthias Duck. Thomas and Matthias were also carpenters. Abel died in 1842 leaving a will which also says he was a carpenter. He left his house to his wife and then to pass to his son Edward, and his business to Isaac. He bequeathed five pounds each to his brother Cain Duck, his sister Ann Dew, and his niece Eliza Dew. The remainder of his estate was to be divided between Isaac, Elizabeth and Thomas. Susanna died the following year. Cain married Elizabeth Manners in 1811 and lived in Blackland, Calne. In 1841 James and Ann were living in Cherhill. Ann had died before the 1851 census and James was living in Calstone with his daughter, Sylvia, her second husband and her children. Priscilla was buried in Calne on 27 April 1806. Isaac died in 1847 and his headstone stands in Blackland churchyard.